With summer here I always hate to heat up the kitchen to cook dinner so we have been doing a lot more cooking on the grill. If you are looking for a new, easy and healthy dinner recipe to try, I have just the thing for you. 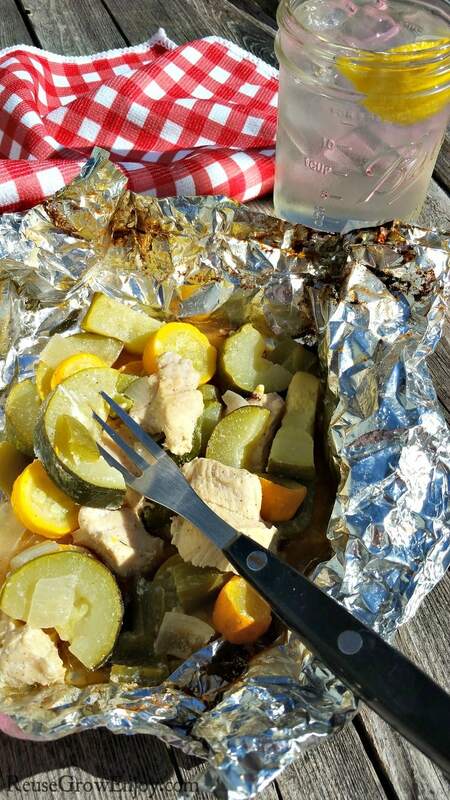 It is a recipe for chicken and veggie foil pack hobo dinner on the grill. Another great thing about this recipe other than not heating up the kitchen, it works great when you are camping too. You can either cook on the grill at camp or place it on a grate over the fire. You can also mix it up ahead of time so that you don’t have to do all the chopping at camp. 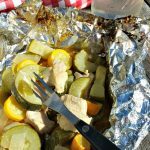 If you are in a hurry you can chop everything together and toss in foil packs and put on the grill. However, I have found that the best flavor comes from mixing it all up and allowing it to marinate for at least 3 hours. Just store the marinade mix in the fridge or cooler until you are ready to cook. One thing to note when you are making foil packs for the grill. It is best to use a heavy duty aluminum foil as it just holds up so much better. The thin cheaper stuff is way to easy to punch a hole in when trying to turn the packs over or take them off the grill. If you like this recipe, here are some other grill recipes to try and cooking over fire tips. Need a healthy dinner idea? Maybe one that can be cooked at camp? 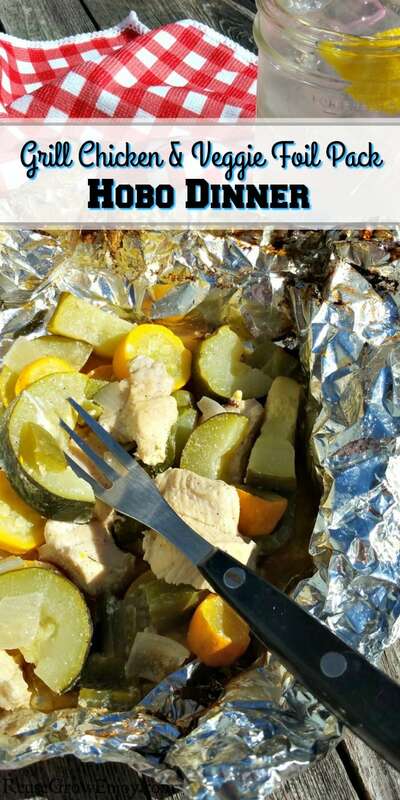 Check out this Chicken And Veggie Foil Pack Hobo Dinner On The Grill! Mix the garlic, salt, black pepper, water, lemon juice and 3 tbsp of oil into a large mixing bowl. Make sure that it is fully blended. Cut four pieces of foil that are about 15 inches long. Lightly coat one side of each piece of foil with a little of the extra oil. Evenly divide the chicken veggie mix on each of the sheets of foil. Making sure that a little of the liquid from the bowl goes with each one. Now you need to close each of the packs. 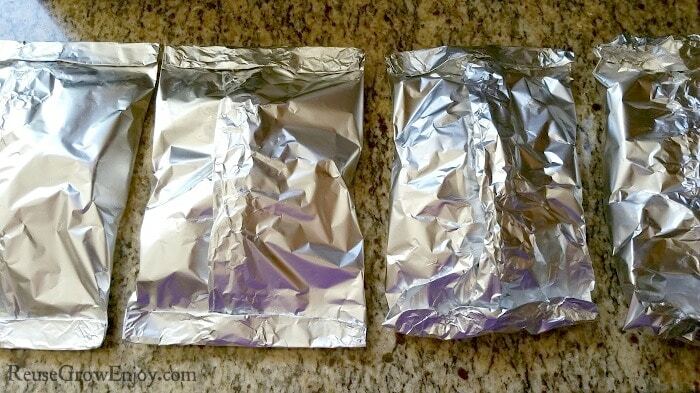 Pull the two ends of the foil together and fold it down two times. Then do the same thing on each end. Heat grill to 400 degrees. Place packets on grill and close the top. Cook on medium-low heat keeping it about 300 - 350 degrees for 12 minutes. Then flip over and cook another 12 minutes or until chicken is done. After you remove from grill it can be served right away or it will also stay warm for a little while if you leave the packs closed and stack them on top of each other.